PENDING THE PROGRESSION OF DOC'S RECOVERY FROM NEWLY DIAGNOSED, OSTEOSARCOMA IN HIS RIGHT LEG. (SIMPLY PUT- MY BUSINESS PARTNER AND BEST FRIEND (DOC) - WILL UNDERGO AGGRESSIVE CHEMOTHERAPY TREATMENTS, FOLLOWED BY AMPUTATION OF HIS RIGHT LEG (AT THE KNEE) AND MORE CHEMOTHERAPY. I EXPECT APPEARANCES THIS SUMMER WILL BE SEVERELY LIMITED, WITH A GOAL OF BEING IN DURANGO, CO. THIS OCTOBER FOR THE COWBOY POETRY GATHERING AND PARADE. DONATIONS ARE ALSO BEING ACCEPTED AT CREDIT UNION OF COLORADO, CANON CITY, COLORADO. ​UNDER HIS NAME: CHARLES DISON. ALL MY LOVE, PRAYING TO SEE YA'LL SOON! ​Who are "Blizzard and Boo", you ask....? 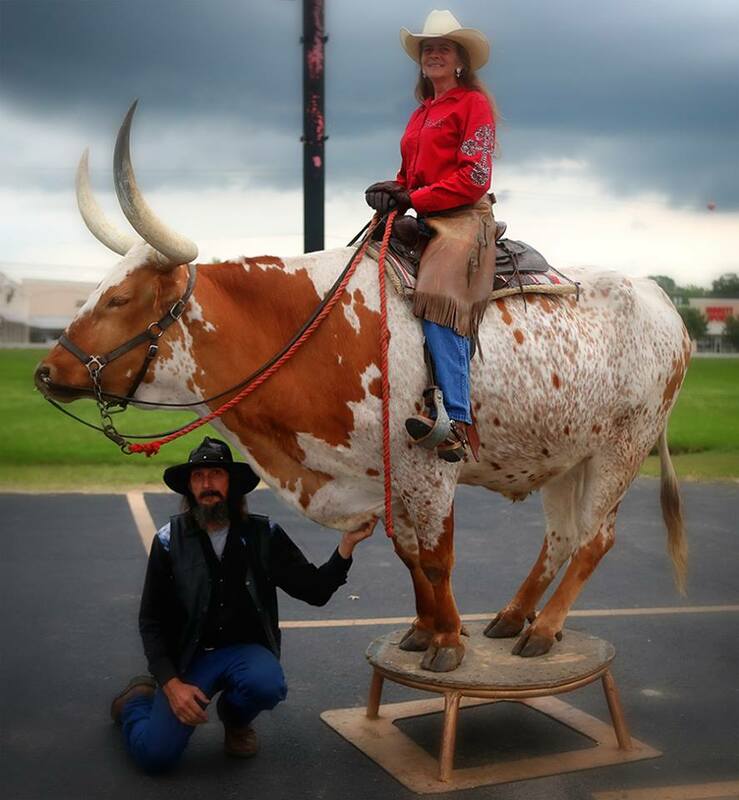 "Blizzard" is a 12 year old, registered Texas Longhorn that weighs in at 2200 pounds. ​"Boo" is his handler, weighing in at, 105 petite pounds of ​PURE heart. Blizzards' devotion and Boos' smile are unrelenting, bringing joy and astonishment to all audiences. Blizzards abilities seem endless when he performs, both in and out of the arenas. Blizzards gentle nature and love of performing make him the perfect crowd pleaser. Book a performance today and witness the pair as they perform a variety of skits and skills, including but not limited to bovine pole bending and barrel courses, along with Blizzard's signature pedestal mount and full honor bow. The intense unspoken bond between Blizzard and Boo is one to be witnessed with your own eyes as Blizzard continuously expresses his affection and sometimes protection of Boo, while responding to simple voice commands. You may even witness a mid-performance, gunslinger showdown if Boo's nemesis should appear. ​Blizzard & Boo, for your event, promotion or rodeo today. Performance exhibitions can happily be customized to fit ﻿any﻿ need or choose from a variety of exhibition and comedy formats. Not sure what you would like to see? Contact us for show ideas based on the time slot you are looking to fill. Many event/rodeo planners book the duo to welcome their visitors, lead parades and provide photo opportunities with meet/greet, when the specialty act bookings have already been completed, promoting true western spirit with an unexpected twist. Need a unique way to promote your business? Shoot us over your contact information for a prompt reply about marketing and sponsorship opportunities. ​There are just a few sponsorship and marketing slots remaining! Present your business to thousands of potential customers, locally or nationwide. Please complete contact form for booking, sponsor, or general information. It don't get more country than this. to appear in your neck of the woods.